As Target prepares to roll out its click-and-collect Drive Up service to hundreds of stores this year, one analyst whose team trialed it has given it a thumbs up for its speed and convenience. “This (is a) delightful service that will gain traction, and is something that Amazon can’t offer today,” Gene Munster, a venture capitalist and tech analyst with Minneapolis-based Loup Ventures wrote in a recent research note. Munster’s team tested the service 10 times at two different Twin Cities locations. While one order for body wash took over an hour to be ready for pickup, the rest of the orders were ready within 16 minutes. And, most importantly, he said, it took only an average of 1 minute and 18 seconds from the time of parking to departing with orders loaded in the car. That breaks down to 35 seconds from the time of parking to an employee walking to the car with the order (Target says it's goal is 3 minutes, but has been doing it in less than 2 minutes) and then 43 seconds for the worker to scan the customer’s barcode and load the items into the car. 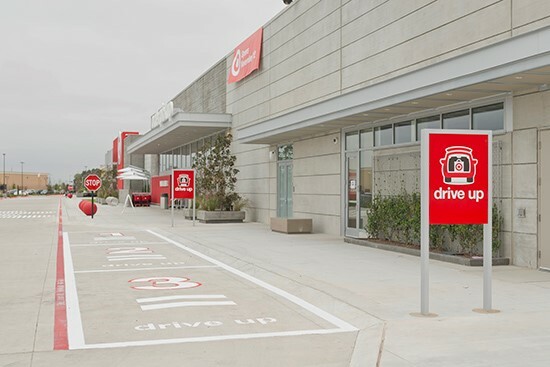 Target started testing Drive Up at 50 stores around the Twin Cities last fall. Last week, company executives said at an investors meeting that they will expand the service to about 1,000 of Target’s 1,800 stores this year. Here’s a quick primer on how it works: Customers place orders via the Target app to be picked up at a specific Target store. The app then notifies customers when those items are ready, usually in less than an hour. Customers pull into a designated Drive Up parking space outside the store and an employee loads the order into their car. The service is initially only available through iOS version of the app, but is coming to Android next month. Target says it's received overwhelmingly positive feedback about the service so far. About half of the customers who have tried it have used it again, according to the company. It's especially popular with shoppers with young children who like the convenience of not having to leave their car. Diapers and paper towels have been the most ordered items. Bulky items such as bottled water and soda have also been popular. One potential drawback though for some customers is that while about 200,000 items are eligible for Drive Up, it does not currently include fresh grocery items such as milk and bananas, which often are the reasons tha send people to the store for a quick fill-in trip. Groceries have been a key element of Walmart's curbside pickup service that it has been rapidly expanding in the last year. It now has 1,200 online grocery pickup locations outside its stores and is planning to add another 1,000 this year. Other regional grocers are also expanding click-and-collect services. In any case, Munster thinks Target's Drive Up service is another reason why Amazon may want to acquire Target. He created quite a bit of buzz with a bold prediction earlier this year that Amazon will buy Target given their high customer overlap and Amazon's interest in growing its physical footprint as evidenced by its takeover of Whole Foods. “Target’s Drive Up service – leveraging assets that only brick and mortar can offer – is a good example of the innovation necessary to compete in retail, which makes Target more appealing to Amazon,” Munster wrote. I asked Target CEO Brian Cornell recently about the speculation that Amazon might buy Target. He joked that it was “clearly a slow news cycle” when the idea led to a lot of chatter. In any case, while not commenting directly on the conjecture, he said the it's another sign that his strategy to focus on stores as well as online is the right one. “Digital alone will not meet the needs of the American consumer,” he said.